A few years back, some friends of mine lived abroad for 6 months. They were a couple with (at the time), two young boys who were 4 and 6. They decided to live in India, and they chose Kerala. The place they lived in was pretty primitive–there were rolling electricity blackouts, and no oven, only a cooking top. Well, this became an issue when it came time to celebrate one of the boy’s birthdays. How do you bake a cake with no oven? The answer: you don’t. Birthday cake, instead, became a crepe cake. What, might you ask, is a crepe cake? Well, it’s basically a stack of crepes with filling in between each layer. Also known as Milles (thousand) Crepe Cake, this French confection is only limited by your imagination. 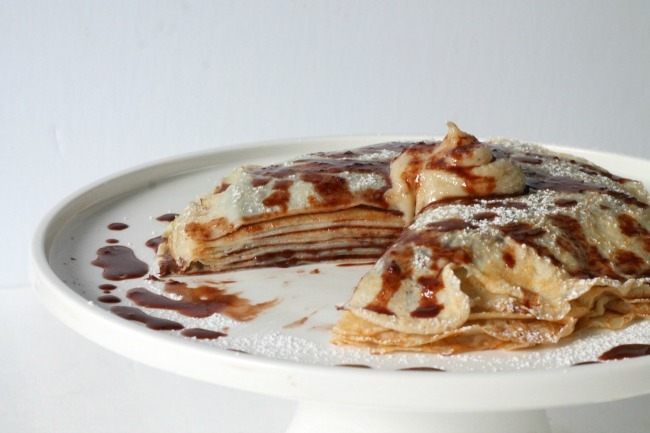 The crepes basically create a blank canvas on which you can paint any kind of flavour. I’ve seen them done with matcha, layers of whipped cream, chocolate, fruit, you name it. I chose a more classic combination for mine. Michael and I love crepes, and our favourite flavor combo is bananas and Nutella. Instead of using actual slices of banana in this (which wouldn’t work with this delicate dessert), I made a kind of banana pudding or curd instead to go between layers of paper-thin crepes. The impetus for making this recipe (which has been on my “to do” list for quite some time) was that I got a new crepe pan: the Anolon Advanced Bronze Nonstick 9-1/2-Inch Crepe Pan , in fact. I have been slowly but surely replacing all of my Teflon pans with cast-iron or other kinds of pans that are not teflon. The problem with making something as delecate as a crepe, is that you really, really need a non-stick surface. If the crepe sticks at all, you are likely to wreck or tear it. My new crepe pan, from Anolon, is made of hard-anodized nonstick, instead of teflon. It’s first of all, free of PFOAs, which are, we now know, not good for us, as they break down over the life of the pan, and may cause cancer. The other bonus of this kind of finish is that you can use metal utensils on it, which is good, because I like to use my ultra-thin Oxo Good Grips Fish Turner when I’m flipping the crepes. Alternatively, you could use an offset spatula, but you need something really thin. One last thing I really like about this pan: the handle is really comfortable. It’s maybe not a big deal if you’re making soup or something, but when you’re making crepes, you are constantly picking up the pan and putting it back down, so a comfortable handle is important. This one is also heat-rated, so you can put it in the oven if you need to. It took a little time to get used to using this pan, over my old non-stick one, but after making 20 or so crepes on it, I was actually really happy with the results. It made nice, thin crepes, with pretty even toasting, and didn’t burn. My one complaint about the pan is that it wasn’t as scratch-proof as I’d have liked. After making a couple dozen crepes, there are small scratches on the surface of the pan from my spatula. It’s fine–it won’t affect the integrity of the pan–but it’s an aesthetic thing. First, make the crepe batter, as it needs to sit for at least an hour or 90 minutes before you make the crepes. While the crepe batter is chilling in the fridge, make the banana curd. Finally, spoon some nutella (about half a cup) into a bowl, and warm it briefly (30 seconds) in the microwave. This will make it easier to work with. To assemble the cake, you have two options. You can either make all the crepes in advance, and store them between layers of waxed paper, or you can make the whole thing on the fly. I made mine on the fly, and found that the warm crepes were easier to work with. 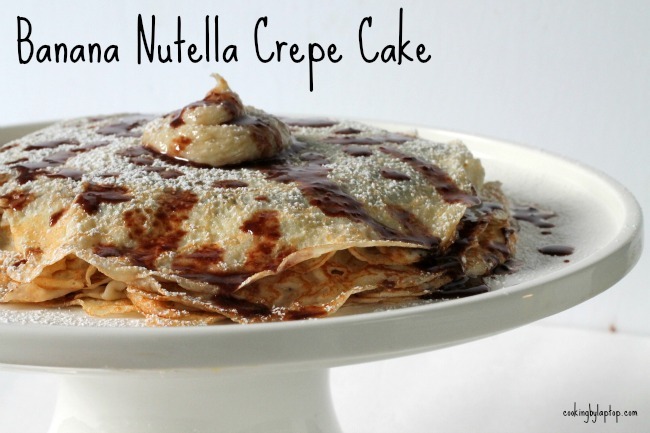 Place a crepe on your plate, then smear it with about 1-2 tbsp of nutella. Place another crepe on top of it, and smear that one with 1-2 tbsp of the banana curd. Repeat until you run out of crepes (or other ingredients). Top with whipped cream if you like, a drizzle of chocolate ganache, or a dusting of powdered sugar.